The announcement comes 16 months after the three-time Tour de France winner tested positive for the steroid clenbuterol. THE COURT OF Arbitration for Sport has declared its intention to publish a final judgement in the case of Spanish cyclist Alberto Contador this coming Monday. The three-time Tour de France winner tested positive for the steroid clenbuterol in September 2010. The Spaniard later claimed the result could be traced to contaminated beef, an excuse deemed satisfactory by the Spanish Cycling Federation (RFEC), who cleared the rider to compete during the 2011 season. That decision was subsequently challenged by both the Union Cycliste Internationale (UCI) and the World Anti-Doping Agency (WADA), a move that spurred a protracted legal battle between the two sides. “The Court of Arbitration for Sport (CAS) intends to publish its decision in the arbitration procedure involving the International Cycling Union (UCI), the World Anti-Doping Agency (WADA), Alberto Contador and the Spanish Cycling Federation (RFEC) on Monday 6 February 2012. 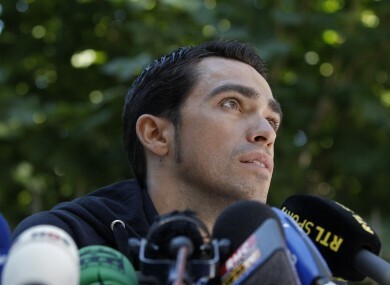 If found guilty, Contador will likely be stripped of both the 2010 Tour de France and 2011 Giro d’Italia titles. Email “CAS to publish Contador ruling on Monday”. Feedback on “CAS to publish Contador ruling on Monday”.